An Istanbul court has ordered the Turkish Football Federation (TFF) to pay compensation for sacking a referee on the grounds of his homosexuality. 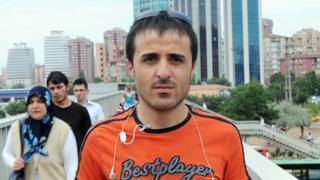 The TFF was fined 23,000 lira ($7,900; £5,300) for dismissing Halil Ibrahim Dincdag, 38, in 2009. The federation claimed Mr Dincdag was "unfit" for military service and thus unable to work as a referee. Mr Dincdag said he would appeal against the amount, but called the ruling "a victory". "Winning this case means a lot to me," he said. "I hope this ruling will be a model for similar cases." His lawyer had asked for 110,000 Turkish lira when the case was filed in 2011. The former referee told Reuters news agency at the time: "I have been unable to find a job since my name hit the headlines. I have received threats, and have lost hope of earning my own living." Mr Dincdag was released from the army in 2009 because of his homosexuality. Military service is mandatory for all men over the age of 20 in Turkey - only ill, disabled or homosexual men are exempt. Referees must complete their military training to work. Two days after he appealed against the federation's decision, stories about Mr Dincdag appeared in local media. He was dismissed from the local radio station he worked at and decided to come out as gay on TV. He went on to win the 2014 Respect Award by the Berlin-based LGBT Alliance Against Homophobia group. Homosexuality is not illegal in Turkey, but there is a social stigma attached in areas outside cities like Istanbul and Ankara. Turkey's military hospitals define homosexuality as an illness, or a "psychosexual disease".